I confess to, on occasion, watching the trio of reality wedding shows that are on the TLC network. There’s Say Yes to the Dress, Say Yes to the Dress Bridesmaids and Four Weddings where brides attend and rate each other’s ceremony and reception. (Have I mentioned these are all on Friday night? That right there tells you a lot about my social calendar.) I usually sit on the couch, my mouth agape, thinking that none of the nonsense I’m seeing really happened. It must be sort of, kind of, scripted because it’s all too crazy. If you do the wedding math the bride is only going to wear her ceremony gown for, what, two hours, max? As for requiring a different dress for your reception – is your wedding really going to be such a throwdown that you need a back up? I’m not a dolt. I know wedding receptions have changed, a lot, from back in my day and I have zero nostalgia for the weddings I attended as a young adult. I was a bride in the 1980’s and, trust me, no one misses wedding gowns inspired by the TV show Dynasty with puffed sleeves so ginormous they could do double duty as umbrellas and receptions held in the church fellowship hall with punch, cake and Jordan almonds. (Just why on the almonds? How did that ever become a wedding thing?) Regardless, I’m still flabbergasted by the receptions I see on TV. There’s the cocktail hour where you pre-feed your guests a light buffet before the seven course, sit down dinner, followed by a post reception midnight breakfast. It’s like the witch in Hansel and Gretel is the wedding cater and she’s stuffing the guests so she can eat them later. But, as of this week, all of the current wedding hoopla makes sense from the multiple dresses to the layering of the reception into three different events. You see I have found the birthplace of this foolishness. The primordial stew, if you will, from where all this festers and flows. It’s called high school homecoming. Yes, that’s right homecoming (not prom, people). A dance held in a gym, that is infused with the odor of a thousand sweat socks, is ground zero for the making of a bridezilla. Confused? Hang on, I’m going to walk you through it. Having lived through my first homecoming as a parent of a girl here’s what I learned. A high school homecoming usually requires two outfits. A fancy-ish dress (with abundant accessories) for the dance and one for the after party which may or may not have a theme. The grooming ritual for the dance can include; spray tan, professional hair and makeup, mani/pedi and, at the very least, an eyebrow wax. Once again, lest you forgot, this is all for a dance in a gym. The “Ho Co” activities are as follows: First, an outdoor photo session with the dinner group (which is at least a dozen kids). This can take upwards of an hour for the parents to get all the pictures their daughters are telling them they need. I have discovered that the picture-taking is THE most important part of homecoming. It’s all about the pictorial. Seriously, for most girls their dates are simply a conduit to a photo-op. Next up, is dinner at a restaurant, then the dance in the gym described as something to be “gotten out of the way” so the teens can head to the after party which, as previously stated, requires a change in outfits. 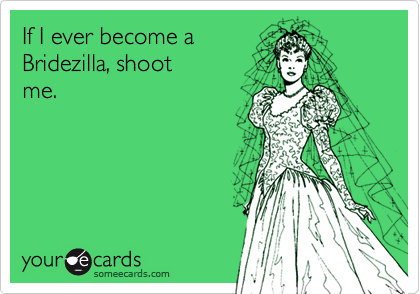 Now, if you have girls, as young as 14, being schooled in this crazy, the whole bridezilla epidemic makes perfect sense. Why wouldn’t you “demand” two dresses for your wedding if you had two for your flipping freshman homecoming dance? This is why I felt I needed to take a firm-parenting stand. I figured it’s never to early to start waging a war against raising a bridezilla. So, I gave my daughter a two-figure homecoming budget and a Discount Shoe Warehouse coupon. Little does she know, that someday, her adult self will thank me or at least that’s what I’m telling myself. I just read an article the other day about the “invite” – where guys are making productions – PRODUCTIONS – out of asking girls to dances. Now it may have been prom, but maybe it was homecoming. Disgusting. Ain’t nobody got time for this. And my freshman daughter found it all not super exciting. She and her friends left early to be ready for the early morning volleyball tournament. Amen, amen, amen! I have a daughter who just got married and I had to keep on preaching it’s about the marriage not the wedding hoopla. I wish I had restricted her earlier on. It might have been an easier process but I was the mom who did the two dress thing etc. I reaped what I sowed. Confirmation of what I’ve always thought. It makes a lot of sense, right? Fixating on the most expensive/biggest/best/make your friends jealous/be all bridezilla-y is not the recipe for a long relationship. I am so opposed to all of it, especially the way it seems to have trickled down to the high school level. I’ve heard of 4-figure budgets for prom. I’ve seen ridiculously over the top asks to homecoming. Someone make it stop!!!!! !